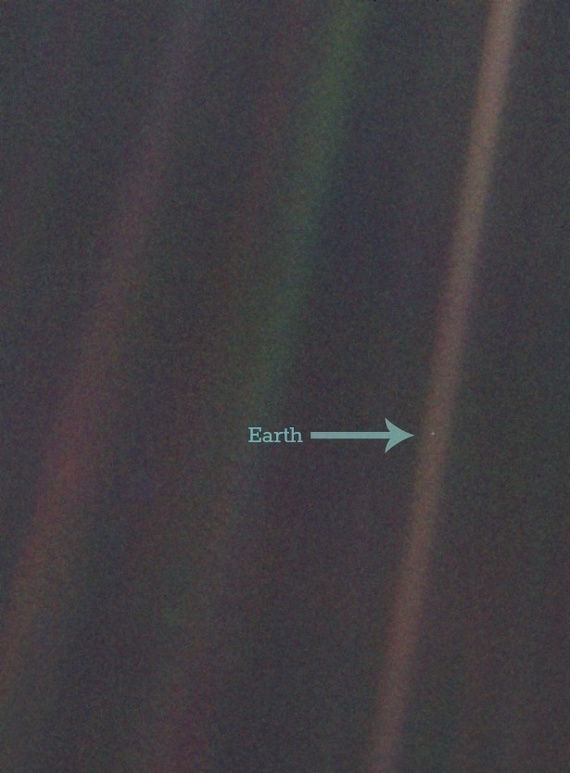 Home › Theology › An Easter Meditation: What Does a Pale Blue Dot Have to do With Christ? As I sit here in a Fijian Airport on Good Friday musing over the message of Easter, I remember reading the above statement a few years ago and thinking what is more mind blowing than the Pale Blue Dot and Dr Carl Sagan’s observations and thoughts is this simple bible verse…John 1:14 And the Word (Jesus) became flesh and dwelt amongst us. The creator of the Universe became incarnate (that’s just a clever word for He became a man), and came and lived on our Pale Blue Dot for 33 years and then humanity nailed him to a cross. Imagine the size of a God who can create the universe: now yielding himself to be nurtured and a human body formed inside the womb of a woman. Imagine what it would have been like for Jesus, who was there as God, Elohim, plural, Father, Son and Holy Spirit, fashioned the earth into being and made man after their own image and who ultimately created the tree that would be the cross He would be nailed to on the Pale Blue Dot. All for no other reason than some people on the Pale Blue Dot would hopefully choose to accept his message of love, acceptance and forgiveness and they would become friends. Yes. Because God doesn’t force people to be in relationship with him. True, our response to God is according on our nature. If we’re still dead in our sin and trespass we don’t want a relationship with Him, but if we’re born again, if we’re declared righteous, if we’re His children, then we naturally do want to be in relationship with Him. Did God hope Noah could survive 75 or so years of flack from those around him and actually get the Ark finished on time? Did God hope Abraham and barren Sarah would eventually have a child otherwise His promises would prove worthless? Did God hope that a burning bush was enough to attract Moses attention? Did God hope that Pharaoh wouldn’t do the logical thing when Moses confronted him, just kill him? Did God hope Mary would say yes to His request to impregnate her and did He then have to hope that Joseph would be OK with it? Did Jesus hope the disciples would follow Him when He called them? Given Jesus’s plea in the garden did God hope He would go through with the crucifixion? Did Jesus hope that His death would be enough to achieve salvation for mankind? Did Jesus hope that he could raise himself from the dead? Did Jesus, after telling Paul all he would have to go through, hope Paul wouldn’t up and run and hide? Maybe I shouldn’t be left alone to ponder. You are right Adrian. God MADE all those things happen which actually makes a mockery of free will. So we don’t really have a choice then to choose God? God must be a monster then cause he doesn’t make everyone accept Christ and therefore he makes them go to hell. I shouldn’t be left alone to ponder your ponderings. And what are you doing outside Palliative care? Someone you love is obviously dying. Sorry to hear that. Prayers. One of Mary’s Aunties Peter, cancer, and an Uncle went of a similar thing in January. And unfortunately she may not be the last, a trying year for the family. Somewhere I read that you should never give Pastors books to read so I can’t help with your pondering that way, so …. I’ll ponder on why some people see God’s Omniscience and man’s will as mutually exclusive. I know that if I ask my wife if she wants to do something (e.g. go shopping) knowing that her answer will be “Yes” then that no way violated her will so why should God knowing what I know be any different? If you think some verse in a magic book are “more mind blowing” than the scope of that image, then I feel very sorry for you. Feel free to pour forward much sympathy as I believe in the magic book and it’s author. God loves you.